Your grips are a crucial part of your bike. They’re one of your only real points of contact. They’re how you control your bike and are one of the places you can most clearly feel an uncomfortable ride. Particularly with mountain biking, where you might experience a lot of bumpy riding, its important that you have comfortable grips. Maybe this is the first time you’re replacing stock grips, or maybe you’re a mountain bike aficionado who’s looking for the perfect grips. Either way, this article will help you find what you’re looking for. We’ve surveyed ten of our favorite grips and explained what we like about them so that you can make an informed decision when you’re purchasing. 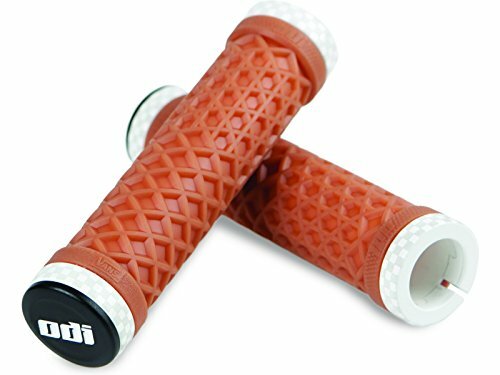 These are some colorful, eye-catching handlebar grips that will guarantee you a more comfortable ride. They’ll fit any handlebars with a diameter of 22mm. They’ve got great protection and offer a soft and comfortable touch, advancing their shock-proof nature and allowing for long-distance comfort. They’ll also give you plenty of control over the bike. They’ve got a raised pattern made out of non-slip rubber so that you’ll be able to get a good grip on them even in wet conditions. The grips come in a range of colors, depending on your existing paint job. 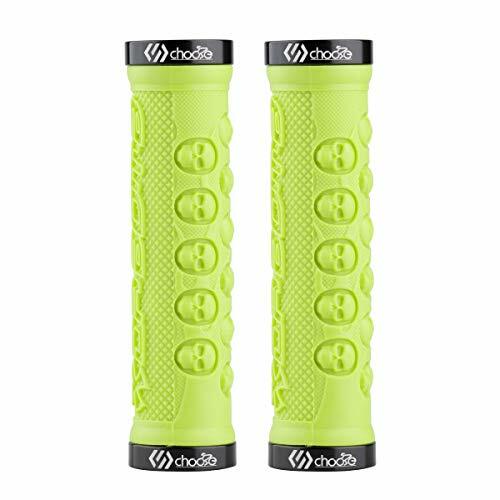 The skull patterns offer excellent grip as well as eye-catching design. Why We Like It – These grips look great and can add a pop of color to your bike. They’re super comfortable and will keep you in control without compromising on comfort. 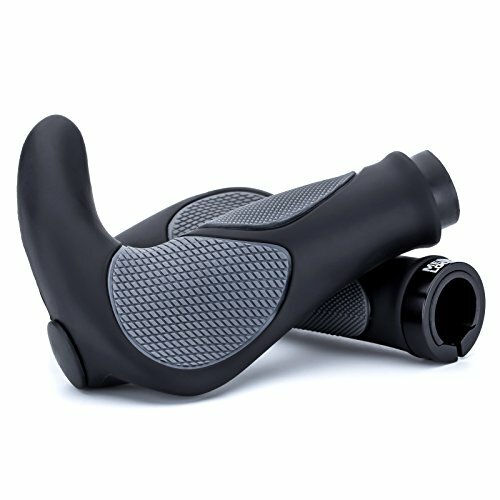 These horn grips are perfect for mountain biking. They offer you a range of holding positions while also offering some protection from whippet branches. They’re ergonomically designed and will provide a high level of comfort over long periods. In addition, hand-fatigue is reduced as is any vibration in the handlebars due to the terrain. The grips also come with a durable aluminum alloy strengthening clamp lock which essentially fixes the grip to the handlebar and makes sure it doesn’t move around while riding. It’s a neat feature, especially because the horn needs to remain at the same point on the handlebars. Why We Like It – This is a grip that not only improves the comfort to your hands but also, thanks to its horned design, adds to the functionality of your bike. Definitely worth a look. These rubber grips are super soft. They are made in Germany from a rubber compound and are extremely cushioned. There’s a winged contact face/ platform which encourages a superior hand position, minimizing discomfort and fatigue. Often the platforms on these sorts of grips can be very hard and uncomfortable to grip. However, the GA3 has a very soft platform that molds itself to the rider’s grip. It comes in a variety of fun and vibrant colors that can either match what’s on your bike currently, or you could give it a whole new look! Why We Like It – A good option for riders who like a little bit of shape to their handles. This strikes a nice balance between a rigid ergonomic handle and one that is purely cushioning. This grip will guarantee you a comfortable ride. 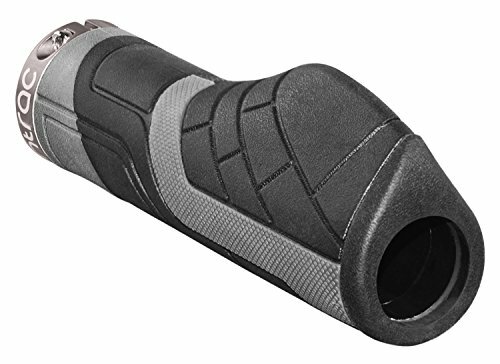 These grips offer raised padding. This is great for two reasons. First, it provides great shock absorption for when you’re heading out over those bumpier trails. Second, just like mountain bike tires, raised grips are going to give you a better grip if you’re heading out in the rain. Also, there’s a textured surface pattern which helps with this. They’re really easy to install with a patent lock-on design that is adjusted using a small Allen key. They come in a sleek, smart black. Why We Like It – The raised padding gives a great level of comfort for long rides on bumpy tracks. They’ll keep you handling well in any weather conditions. These are similar to the ODI Rogue design, featuring the same lock-on design that makes installing easy while ensuring they won’t slip around, no matter the conditions. They are, however, more suited to a racing mindset. They’ve got a narrow profile which reduces arm pump. The surface features a diamond-pattern texture which offers great traction when holding the grips. It means that they still offer a good level of shock absorption and comfort, despite their slender profile. Why We Like It – A good choice for someone looking at the more racing-end of mountain biking. 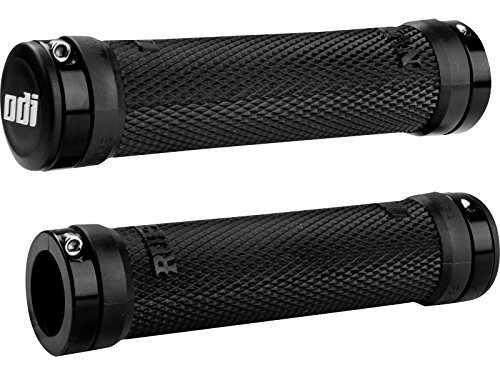 These grips have a very narrow profile while still immeasurably improving on the comfort of your stock grips. These are a great-looking set of grips. They come in black with a choice of trim colors: blue, gold, green, or red. 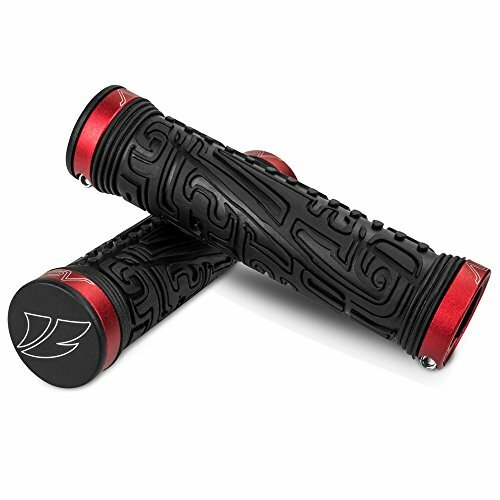 The pattern on the grips is inspired by Maya designs, and it is super striking. As well as this, the texture offers a stable and tacky grip. The TPR material absorbs shock and will prevent hand fatigue or numbness over the course of long rides. They have an average profile and won’t look too bulky on your bike. In order to fit them to your handlebars, all you have to do is make use of the double clamp design which will ensure they remain stable under all conditions. Why We Like It – This is a grip that’ll look great on your handlebars. It’s been made with materials that are made to last while offering you an excellent level of comfort. This grip is the product of a collaboration between ODI and Vans, the shoe company. The pattern on the grip is the trademark Vans waffle pattern on all its shoes. This pattern, while also looking iconic and cool, offers a great level of grip. It’s constructed from ODI’s proprietary grip compound and offers an excellent level of control in all conditions. The grips will clamp on easily, and they come in a range of color options. These include an exciting electric blue and a classic gum that is a clear nod to BMX culture. Why We Like It – Two classic designers combine to make one great piece of kit. It looks great and will perform well in a variety of conditions. This is an ergonomic grip that is designed to manipulate the rider’s hand into a position that minimizes discomfort and numbness. This is an option to consider if you find a normal riding position to be frequently uncomfortable. The material has a high level of elasticity which enhances comfort, shock-absorption, and traction. It is incredibly durable and made from durable thermoplastic elastomer rubber (TPE/ TPR). ToF installs, there’s an anodized aluminum lock ring which will hold your grip in place and stop the ergonomic design from shifting. Why We Like It – The ergonomic design adds a great level of comfort for long rides. It’ll really improve how you connect with the bike and reduce any numbness that might occur on especially long rides. 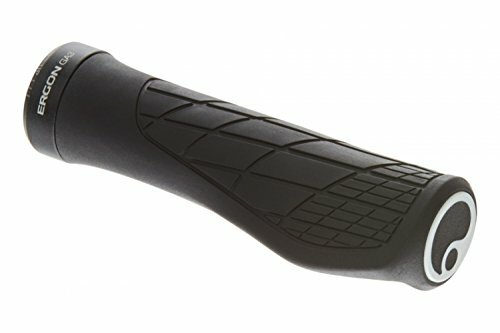 These grips are extra chunky in order to increase handlebar control and shock absorption. They’re made from silicone and are extremely soft, which will give you great handling capability. To install, just slip them over naked handlebars and they’ll self-adhere. Due to the silicone, they’ll not slide around easily and will even need rubbing alcohol to get them off. They’re inexpensive but will go a long way to dampening trail chatter without dampening the overall feel or reducing the responsiveness of your ride. Why We Like It – If you’re looking for classic, slide-on grip, then these are the ones for you. They’re made out of soft silicone with great shock-absorption capacities. They should offer you a really excellent level of comfort across difficult terrain. These grips are made from soft but durable rubber. They’re got anti-bacterial properties so won’t harbor any germs from your sweat. In addition, the material used is hard wearing so they should last you a long time, depending on use. There’s a custom anatomic raised surface which improves hand traction, especially in wet conditions. 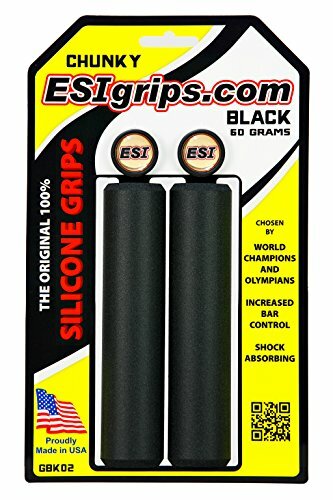 For the cheap price, they might be a good replacement for your stock grips or as an introduction into the world of custom grips before you decide on something more permanent. They come in a wide range of colors if you’re looking to match an existing paint job. They’re easy to take on and off and don’t have any camps. Why We Like It – It’s a straightforward but cheap mountain bike grip but one that’ll really improve your riding potential. They have good adhesion without being gummy or tacky. 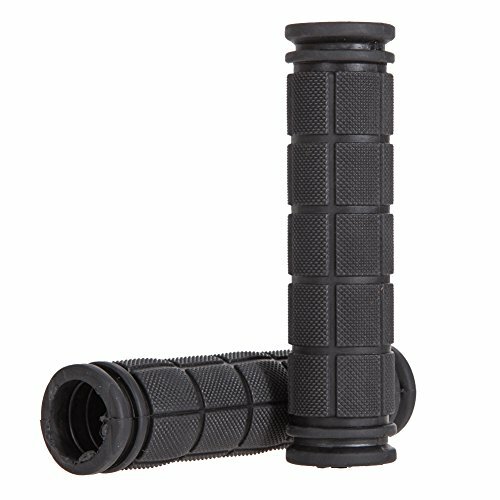 There are a few things that it is useful to bear in mind when you’re choosing what grips to buy. In this buyer’s guide, we’ve explained why some of the different features might be useful to different riders. There are a variety of materials that you can choose from when deciding what grips you want to buy. Often a good choice for your grips is to choose something as soft as possible. This might mean it’ll wear out a little bit more quickly, but it’ll also give you superior comfort and cushioning capacity. Most of the grips in this review are made out of rubber. Usually, it’s a very good option, but it can come in a range of hardness. If you’re looking for something with maximum cushioning, look for something which tells you it is especially soft. Texture and profile both improve the traction of the grip. Texture tends to refer to a pattern on a grip that can offer both comfort and traction. Profile refers to when part of the grip has a raised design. This can make the grip a little bit chunkier, but it will offer better traction, especially in wet conditions. If you’re looking for a racing design, choose something with a slimmer profile. Ergonomic designs work by encouraging the rider to hold the handlebars in a way which improves comfort and prevents numbness. They’re a longer-term solution to problems of discomfort. Sometimes they also offer additional padding, sometimes they offer less of this. Ergonomic design is a good choice if you do a lot of long-distance riding and you often find your hands getting sore. A lot of these handlebars come with locking rings. This means they won’t move around when you’re holding on to them. This can be a really useful feature, especially for ergonomic models where it really matters what angle they are positioned at. They’re a little bit more difficult to swap in and out, so if that matters to you, choose something with the slide-on installation. When you’re choosing your grips the most important things to consider are comfort and traction. If you’ve been getting sore hands when you’re out riding, replace your grips with something softer and more comfortable. If you’re looking for improved handling, maybe in wet conditions, choose a grip that gives you plenty of control. Whatever you choose, spend some time thinking about your decision: grips are a really overlooked part of most bikes. As a rider, you’ll spend a lot of time with them, and they can make a lot of difference to your riding experience without you having to spend far too much money.